Sasser erected stone and made bridge" is the inscription on a runic stone near Fjenneslev Church between Sorø and Ringsted. The 2.20-metres-tall granite runic stone was found when the churchyard wall was demolished in 1830 and it was re-erected in about 1910. The inscription runs from the top to the bottom of the stone. This, combined with the cross on top of the stone, would suggest that it was written during the transition from the Viking Age to the early Middle Ages. 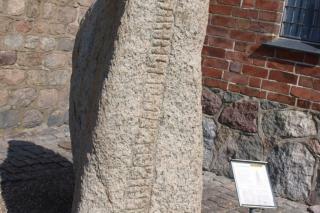 The stone is dated in a publication listing the Danish Runic memorials as being from about 1030. The bridge Sasser refers to still stands nearby. The stone may have been in the same place before it became part of the churchyard wall. " Sasser Bridge, which crosses the river of Tuel, is one of Denmark's oldest bridges. Near Sasserbrovej, it was once a part of the main road between Ringsted and Korsør. Sasser, who had the bridge built, was a powerful man. Fjenneslev was the centre of one of the most powerful families of the Middle Ages, the Hvide family. Sasser no doubt belonged to this family which, as faithful subjects of the King, earned enormous fortunes. The Hvide family lived near the most important arterial roads on Zealand. In times of civil war, it was very important that the King and his men could cross Zealand safely, rest and gather provisions along the way. Sasser Bridge was part of this system.